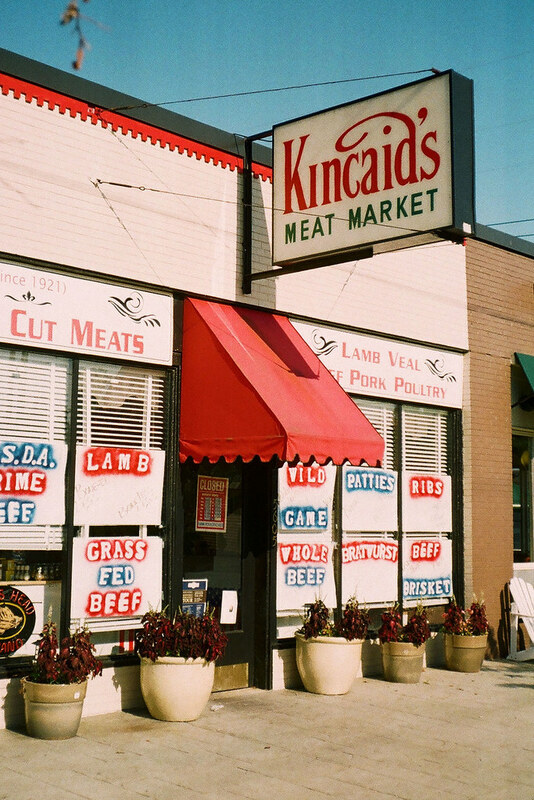 My first experience with Kincaid’s was when my first wife bought a standing rib roast here for our first Christmas dinner in our home. It was outstanding, almost a religious experience. And it was so large that not only did it feed us Christmas night, but the next night too when my first wife went out onto the freezing patio to grill the leftovers. Since then I’ve bought several fresh turkeys for Thanksgiving or Christmas here. Even their everyday hamburger is several cuts above what you can get at any grocery store. Kincaid’s is at 56th and Illinois Streets in Indianapolis. Longtime readers might remember the Kincaid name, as I chronicled the move of a historic house this family once owned. Read about it here, here, and here. Such a pleasing image. Reminds me of Kodachrome! Thank you! And I’m happy the ad gremlins didn’t block your comment today. It does the same on iPad. Appears for about 1/2-second, and disappears. I have never seen this before. Flickr is fine, except for this. It appears to be fixed now!